Think you have spent a little too much time in the Hawaii sun? We know this expired a’ama thin-shelled rock crab has. Black in color while alive, a’ama turn a dark red as they are baked by the sun on dark lava rock. Found on practically all Hawaiian shorelines, the a’ama (Grapsus tenuicrustatus) plays a vital role in keeping the shoreline free of organic debris. 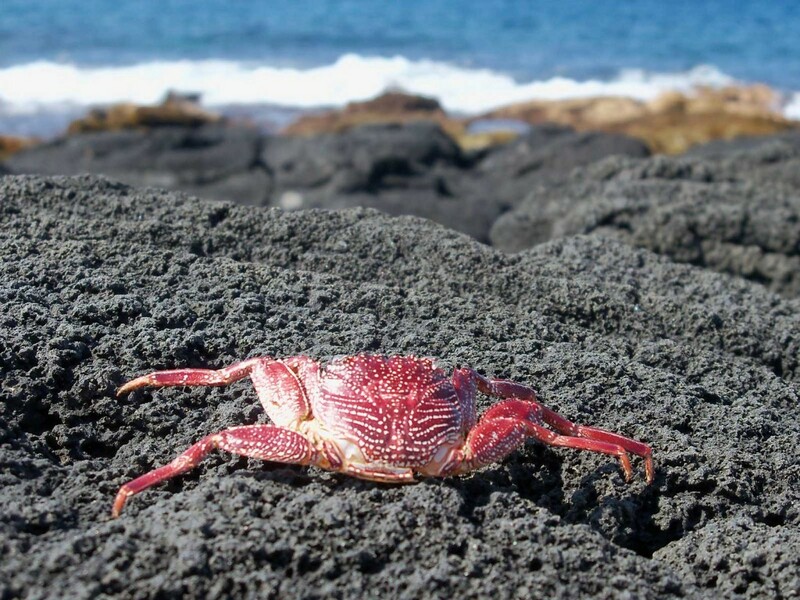 Besides being fun to watch as they scamper and jump with surprising dexterity, Hawaii’s rock crabs eat all manner of insects and small dead animals. Their diet leads to cleaner shores and hours of entertainment. Some eat the a’ama, usually raw, with a bit of sea salt. Aaron Brown (Editor in Chief at Hawaii Picture of the Day) is an amateur photographer who enjoys looking for unique angles and unique subjects. I just wanted to share some info on the A’ama crab in Hawaii. It wasn’t until I lived in Hawaii for many years I learned about these interesting creatures. I too use to think they died and the sun turned them red. The interesting thing about them is they have a living cell that is called Chromatophores. The Chromatophore helps aid them in camouflaging them in their surroundings. They usually camouflage themselves black to match the black rocks they live on. But in other areas where they have been found they have camouflaged themselves to match their background. The reason you see the red ones on the black rocks on Hawaii beaches is when they shed their shells, the shells Chromatophores are no longer alive and their true red color is then revealed. When I learn about these unique fascinating creatures it made them quite more interesting to watch. Great stuff Jan, thanks for sharing this information!